I took a bit of a blogging sabbatical last week to take full advantage of the upcoming holiday that is my absolute favorite, Christmas! I wanted to be fully focused and enjoy the passing moments so I did my best to avoid my computer for the whole week. While I couldn’t do it 24/7 (I still had my day job to do), I managed to keep myself from delving back in too much. Now that I’ve had a very eventful and restful break, I am completely ready to be back! I couldn’t wait to show off this Kate Spade dress that I bought as an early Christmas/Birthday present for myself. I am turning 26 after all and I consider every birthday to be a big birthday. 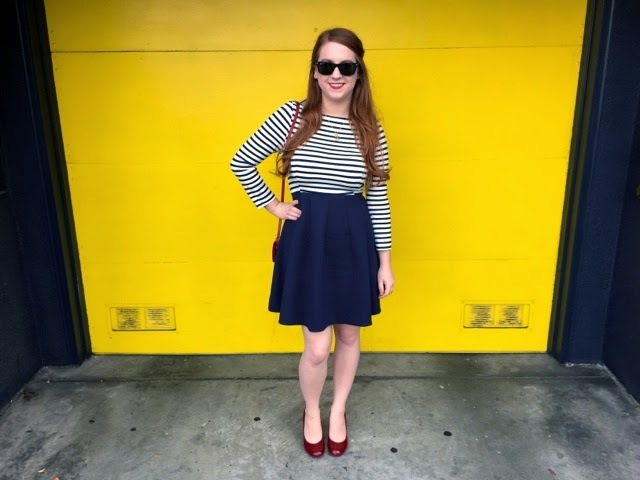 This fit and flare gem of a dress was the perfect outfit for an afternoon brunch with my boyfriend and my sister as we got ready to celebrate my favorite holiday. 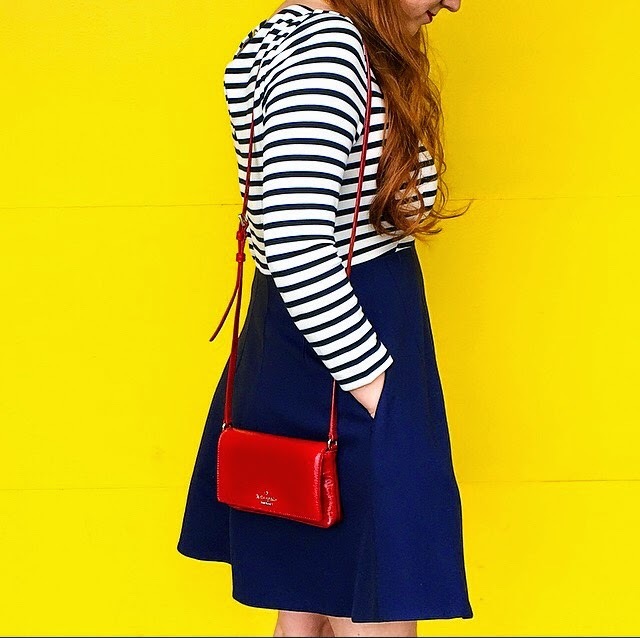 I paired the dress with a bright red cross body bag and a comfy fair of red wedges. I felt very nautical the whole day. I love that almost all Kate Spade dresses have pockets. Dress pockets are a HUGE plus in my book. 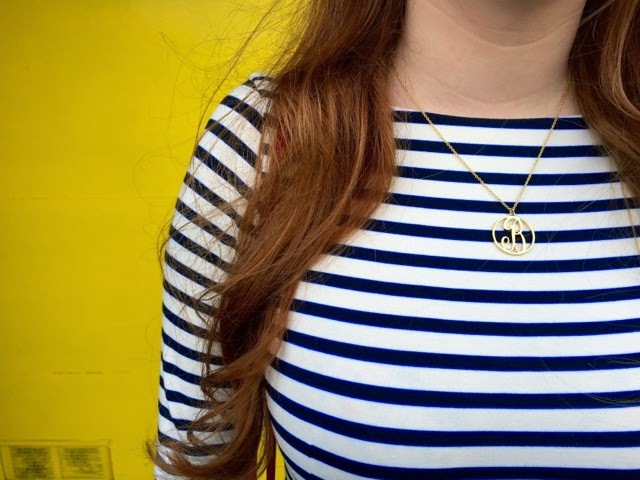 I just adore this C.Wonder initial necklace that I’m wearing. It came in a gift box that also has the matching B initial earrings too! Cute dress! I bought my first dress with pockets this year and now all my dresses MUST have pockets! Love the outfit. I am all about stripes!! This is so classic. Love Kate Spade!! Perfect outfit!!! And those red shoes! Oh.my.gosh. All the colors in this post are just darling! Love love LOVE! LOVE that outfit! Happy new year! So love that the dress has POCKETS! I can hardly ever find ones with pockets in them – awesome! Gorgeous!! I rarely see red blue and white together without it looking overly July 4ish – but this combo is stunning! 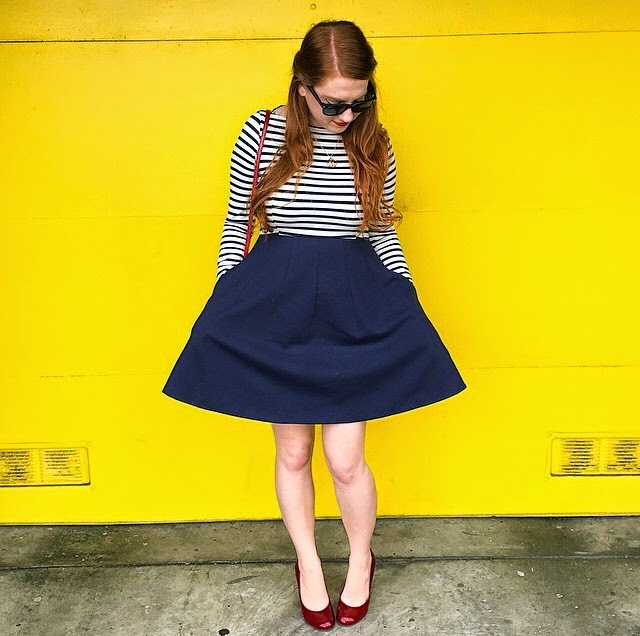 I love the outfit, but love the yellow wall behind you even more! It really makes your outfit pop! so simple but adorable.. you have the best fashion style..